Without jobs, where's the recovery? 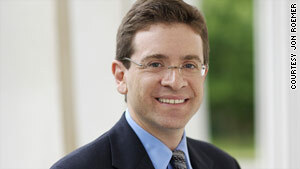 Julian Zelizer believes that high unemployment rates hurt both the Democrats and the Republicans. Zelizer: Experts fear underemployment could become the "new normal"
Editor's note: Julian E. Zelizer is a professor of history and public affairs at Princeton University's Woodrow Wilson School. His new book, "Arsenal of Democracy: The Politics of National Security -- From World War II to the War on Terrorism," will be published in December by Basic Books. Zelizer writes widely about current events. Princeton, New Jersey (CNN) -- When the stock market broke the 10,000 point barrier a few weeks ago, many investors celebrated. Economists have started to talk about the end of the "Great Recession." But many Americans can't see what all the enthusiasm is about. National unemployment rates remain extraordinarily high, having reached almost 10 percent. According to the Congressional Budget Office, unemployment will climb to 10.2 percent in 2010 before falling to around 9.1 percent the following year. Within particular states, the situation is dire. In Massachusetts, unemployment rates have reached a level not seen since 1976. Michigan's unemployment rate is at a little over 15 percent. State budgets, according to a report by the Rockefeller Institute of Government, are still devastated by rapidly declining tax revenue. According to its study, collections by states fell by 16.6 percent from April to June. The term that is being used to describe this situation is a "jobless" recovery. Some experts are worrying about a "new normal," in which unemployment rates remain much higher than before. "We're going to have elevated unemployment for four years to come," said one economist at the liberal Economic Policy Institute. Since the 1970s, this has been the trend. Jobs have taken longer to reappear after recessions end because a weaker manufacturing sector can no longer produce the kinds of jobs that used to exist in the post-World War II period, the era that one historian has called an era of "grand expectations." Many jobs have gone overseas and will never return. Now the nation needs high rates of consumer spending to boost the powerful service sector, but this will take time. A jobless recovery is in some ways a predictable, though unsatisfactory, kind of recovery after several decades when the nation has witnessed growing income inequality. The gap between the rich and the poor has continued to increase through the 1990s and 2000s. Now we are watching a recovery where the improvement begins up top. But the so-called jobless recovery -- a term that in fact suggests we are not seeing an actual recovery -- threatens both parties politically. For Democrats, the threat is twofold. The first is that voters unhappy with economic conditions could take it out on the party in power. The other threat is that the failure to resolve high rates of joblessness will open Democrats up to the neo-populist attacks some Republicans have been employing as they blame the administration for focusing on saving Wall Street but not doing much for Main Street. The threat from joblessness, however, can also harm Republicans. Many party officials still acknowledge that the severe financial collapse that took place in the final months of President George W. Bush's administration remains a huge liability to the party given that voters still associate his White House with that collapse. And so far, polls indicate that many voters are unhappy with the Republican Party and don't see the GOP as offering a positive domestic agenda. It is possible that continued frustration about jobs allows Democrats to target Republicans as an obstructionist party that has in fact hampered their efforts to revitalize economic growth. During the 1930s, President Franklin Roosevelt understood that you could not have recovery without jobs. This is why he made public works programs the centerpiece of the New Deal. Although we often remember Social Security or the National Industrial Recovery Act, the major government intervention that happened in that decade, as the historian Jason Scott Smith recently documented, was public works spending. Two-thirds of emergency spending between 1933 and 1939, he writes, went to public works. From the start, FDR realized that without getting people back on the job, his party would remain vulnerable. Both parties have a political incentive to take more aggressive action. There have been several recent proposals that could potentially gain bipartisan support, including some kind of tax credit to stimulate hiring, increased economic assistance to the states, and an accelerated schedule for spending the rest of the economic stimulus money that was appropriated in February 2008. With joblessness, both parties have an issue on which they should be able to find some common ground. If the moral imperative to make sure that Americans can feed their families is not enough in Washington, Democrats and Republicans should at least be moved by the political risks that both parties can face as a result of inaction.